If you want to be great in God’s Kingdom, which of these choices should you do: 1) Become the “shot-caller” of your church…the lord over the flock; 2) Become important in the eyes of many by making a great show over how much money you give; or 3) Learn to become the servant of everyone?? Jesus reminded his Apostles many times that His ways were not the ways of the world. If someone wants to be great in the eyes of God, they must learn to become the servant of all (Mark 9:35 for example). The workforce of the world defines success by a pyramid with the greatest being at the top. A person begins at the bottom and works their way toward the top (often with a survival of the fittest mentality…”dog eat dog world”). To become the master of all, being the CEO or some such title, is considered ultimate success…greatness in the eyes of the world. Jesus outlined a completely opposite journey toward greatness. 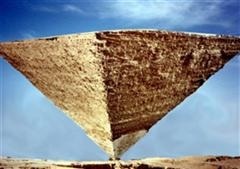 For the Church, success is defined by an upside down pyramid with the greatest being at the very bottom. When a person becomes a Christian, they are place at the top of this upside down pyramid with everyone else serving them. When they are faithful and begin to serve others, the Lord moves them down a layer and they begin to hold up the people above them. The goal of every Christian is to be as far down on that upside down pyramid as possible…being a servant to everyone above them. Jesus demonstrated the concept of being the very servant of all and now calls us to do likewise. This past Sunday was a very special day in the life of the Church I serve. Our Bishop, Metropolitan Isaiah, was present to ordain one of our men to the Holy Diaconate. This is a major ordination within the Orthodox Church. For those readers who are not Orthodox, some clarification may be helpful. In some segments of Christianity, churches have many deacons…some have a “Board of Deacons”…in which people may serve for a time and then step down. Some churches “appoint” people deacons and that “appointment” might be for a certain length of time. Other churches do not have deacons, but utilize a “Board of Elders” or something along those lines to help with the administration of their particular church. In the Orthodox Faith, ordination is for life…a life of service to Christ and His Church. Every Bishop was first ordained a Deacon, then a Priest, before becoming a Bishop. Every Priest was first ordained a Deacon. To be ordained is to be called to a life of service…being a servant. Being ordained in the Orthodox Church is both recognition of already being a servant and a calling to become more and more a servant of everyone. A person’s life is carefully examined before he can even be recommended for ordination to the Holy Diaconate. The Holy Scriptures give these guidelines: “Likewise deacons must be reverent, not double-tongued, not given to much wine, not greedy for money, holding the mystery of the faith with a pure conscience. But let these also first be tested; then let them serve as deacons, being found blameless. Likewise, their wives must be reverent, not slanderers, temperate, faithful in all things. Let deacons be the husbands of one wife, ruling their children and their own houses well. For those who have served well as deacons obtain for themselves a good standing and great boldness in the faith which is in Christ Jesus” (1 Timothy 3:8-13). The early Church clearly saw the role of Deacons as clergy. St. Ignatius of Antioch, who was a disciple of the Apostle John, wrote the following: “Without the bishop, priests and deacons it [the community] cannot be called a church.” Deacons were never meant to be simply ornamental but were essential for the Church. This past Sunday, we witnessed now Deacon Thomas first ordained a Sub-Deacon. Following that ordination, he had a towel placed over his head and a basin with a pitcher of water in his hands. He was then placed in front of the Holy Icon of Christ for the rest of the service until his ordination to the Holy Diaconate was to take place. The towel and the pitcher are both reminders that clergy are called to be servants…indeed servants of all. In fact, just seeing Deacon Thomas with the towel over his head should remind everyone of the calling of God in their own lives: Learn to be the servant of all!